I nominate Achievement of Projected Sales Ramp Rate (Time to Ramp – “TTR”) as the single most important metric for your business. To get resounding support for this, I’d better explain a few things. First: What is the Sales Ramp? There are both Financial and Effectiveness reasons. I got a big lesson in these in the PC business, where we had no more than 3 months after product introduction to make money on products that had taken 12-18 months to develop. After three months, deep discounting would begin and you could abandon hope of making up the lost profits missed in those critical first months. The PC case may be an extreme case, but many people seem to think they have all the time in the world to make money on a new product. They don’t. I love a good delusion as much as the next guy, but the cost of this one is way too high. the fact that technology itself diminishes in competitiveness over time. Identify and solve start-up problems early. More on these topics below. 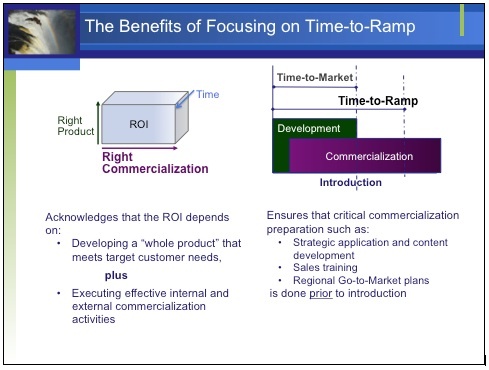 How is it Time to Ramp (TTR) different from Time to Market (TTM)? This metric became very popular as the value of being first to market and then the importance of fast product iteration became clear. 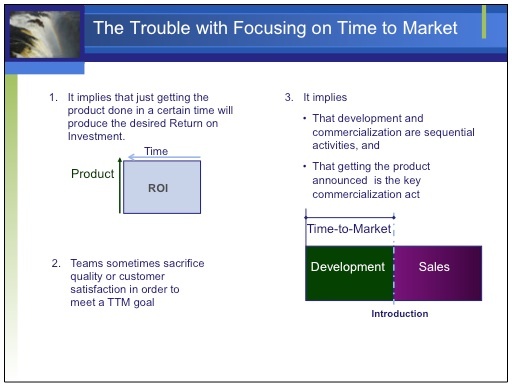 Those are still very valid concepts, but a narrow focus on time to market has a dark side. Time to Ramp measures the span from start of development to the time at which the initial targeted order rate is reached. Figure 2 summarizes the benefits of this approach. So far I’ve highlighted the business benefits of adopting this metric, but among the most important benefits is that employees will be happier, broader and more confident in their future with the company. I am sure that either as an employee or as a manager you have seen how much employees worry when they see important things that are not getting done. They know or fear that those omissions will diminish the impact of their own hard work. Adopting TTR metric not only shows that management “gets it”, it prompts employees to raise and address many common gaps. Sure, that means more action items, but employees would rather have to prioritize from a full list of the actions that spell success than execute on a perilously incomplete list. The more holistic view of project execution also requires functions to work together. That kind of collaboration fuels employee development, flexibility and innovation. Ok, I have to stop now before I find myself swearing that this metric can make your dog immortal or do away with world hunger. Before I sign off: Why the waterfall? 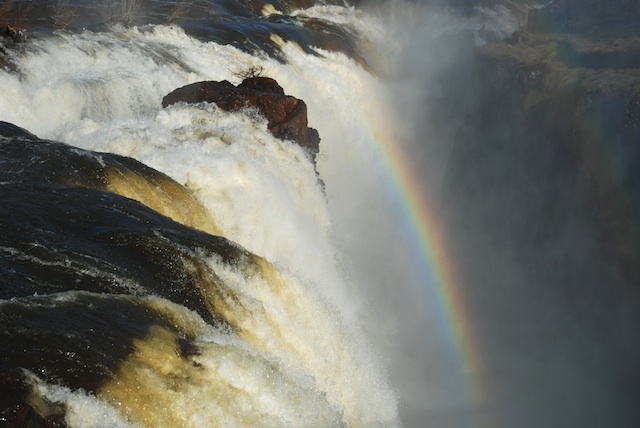 A great metric is like the land formation under a waterfall. Both naturally lead diverse sources of energy into a flow that has extraordinary power, reach and impact. How to assess your Time to Ramp performance and solve key causes of underperformance. How to modify Product Introduction requirements to promote great TTR results.